What’s Hot with Men’s Socks? Need to knit something for that special guy in your life; socks are it, the bolder the better. Guys are now expressing themselves through their socks. Gone are the plain black, brown and navy blue socks and in are the bright bold colors and in designs. There is something magical about this time of year. I have always thought it was a time of miracles. People seem light, happier and kindness abounds. It is a time for family and friends and good food, too much good food I think. 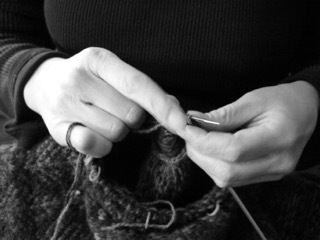 When you sit down with your needles and yarn pattern, or no pattern, you are creating art. Through your hands the yarn is being transformed into something that is made by the human hand and as such it cannot be replicated exactly the same way by any other human. The holiday’s are upon us with few knitting day’s until Christmas, my suggestion would be to do small projects…mittens, hats and sock. My daughter recently moved back to Montana with her family. She just had a birthday and decided to do a 5k run on Thanksgiving Day. When she woke on the day of the run, it was in the single digits. There was nothing to be done except find the wool things that Mom had knit. Sifting through the many moving boxes, she finally came up with her red snowflake hat and grey and white mittens. Sadly she didn’t find a wool scarf and had to make due with a store bought cotton scarf. The run went well. She was toasty warm in her hat and mittens and greatly enjoyed the challenge of the run. I had made those woolen items several years ago, and it is so nice to see that they withstood the test of time. That is the great thing about wool. It lasts forever and the traditional style is not dated. Wool is a wonderful material, soft, and warm even when wet. Our Thanksgiving brought snow and very cold temperatures. The only way to survive is cozy wool socks, sweaters, mittens and hats. Knitting for your family today will last them a lifetime. The Thanksgiving holiday week-end is over and we are moving into the Christmas season. Thanksgiving was my favorite holiday as a child; we would always go to my maternal Grandparents’ home. They lived in a small two bedroom home that my Grandpa and Great Uncle built. It was situated in a neighborhood close to downtown, Great Falls, MT. My parents would pack the three of us in the backseat of the family car and off we would go on the drive, only taking about two hours. We lived in Lewistown, MT. It took four hours when we lived in Kalispell. So a small home which usually accommodated two people, suddenly had to accommodate seven people and there was only one bathroom. Very close quarters, but we always had so much fun and so much love filled that tiny home. Thanksgiving day would start with the turkey; my Grandma always said we had to tie the turkey up so it didn’t run away. So we would get the turkey under control and start on all the extra dishes of which there were many. By the time it was time to eat, the kitchen held cozy warmth from all the activity, and we would gather in the kitchen. Many times we had to open windows even though it was in the twenties outside, to add a little fresh air. As I have grown older, Thanksgivings are not the same and have lost a lot of the appeal it once held for me. It is strange that the simplest things could bring so many happy memories. Our world is so complex now. I wonder if the children now will be able to create such wonderful memories of simplicity , warmth and love.